Farmhouse vintage bottle decor made easy. Decorating with vintage bottles is an easy way to add Farmhouse style to your home. This glass bottle decoration idea is a quick and easy DIY I am loving! On the menu today a little farmhouse style decor with green vintage bottles. Decorating with glass bottles doesn’t get much easier than this. I don’t know what it is about green, but it seems to be popping up in my decorating more and more. It is giving blue a run for its money…. I think it pairs wonderfully with the browns from pine cones and branches and it is such a peaceful color. I combined new and old here. The oil lamp is most definitely new. I found it at Action, A Dutch discount store. It was a steal and I could not possibly leave it behind. In fact I didn’t twice, because I got another one in ….. you guessed it …….. blue. That one will pop up in a vignette very soon too, I have no doubt. I think the new glass pairs well with the old French bottles. 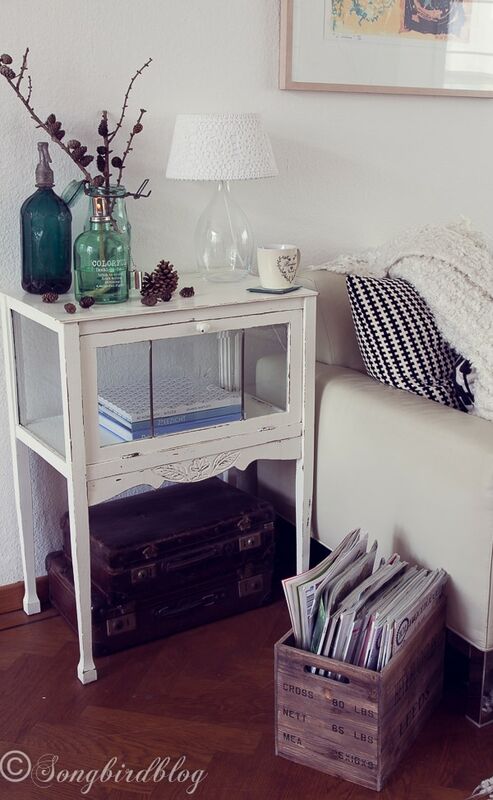 Together they are the perfect vintage bottles decor. Found those in a newly discovered vintage treasure trove. I found the store and then made myself not go there for a long time, because I knew things would get out of hand. These two vintage bottles are just the beginning. I posted a glimpse of the rest of my treasures here. My little tv watching, magazine reading, tea sipping and nap taking corner has a new vibe. Perfect for those evenings that are getting darker by the day. 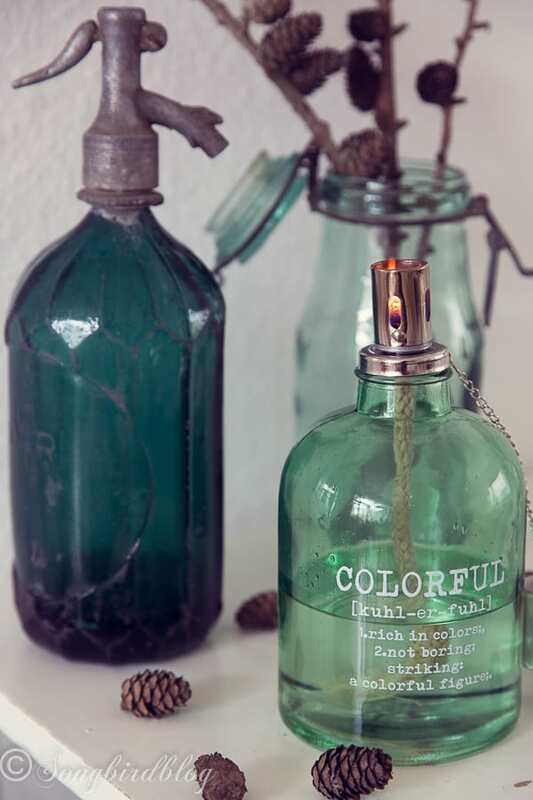 Farmhouse decorating with green vintage bottles. Doesn’t get any easier than this. We have had a few summer like days here in New Hampshire too, but they say the ‘normal’ cool Fall weather will be back this weekend. Your Fall corner is lovely. The bottles are wonderful and how thoughtful your ‘love’ was to set you free in the store. Summer (even the Indian one) is definitely over in this part of the world too. Time to bring the blankets out, I guess. So pretty. I love the blue and green bottles with the branches and pinecones. It’s refreshing to see a twist on the typical fall colors of orange, red and yellow. Thank you! I think the green and the browns work well for Fall, I was actually surprised in a good way too, about how this turned out. Sometimes you just start with a little grouping of things and it just turns out quite nicely (other times, of course, it doesn’t LOL). What a unique find that is a twist on fall decor but it makes sense. The leaves are green turning color here. Thus green bottles? Autumn color. But alas, I have no plant that has the branch and teeny pinecones. I really like the look. Thanks dear! Sorry to hear you don’t have the trees with the tiny pinecones, but then you have California sun and we have gray autumns (the grayness is about the kick in over here).